Light welterweight boxer Josh Taylor will fight on the undercard of stable-mate Conrad Cummings’ ‘All on the Line’ show at the Waterfront Hall in Belfast on Friday. 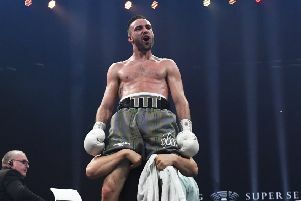 The 24-year-old will travel to the Northern Irish Capital later this week in what will be his third professional bout since signing a contract with former featherweight world champion Barry McGuigan’s Cyclone Promotions in June. His opponent is still to be confirmed. The 2014 Commonwealth Games gold medallist recorded his debut win as a paid fighter in El Paso, Texas, in July before stopping Hungarian lightweight champion Adam Mate inside 90 seconds at Meadowbank last month. McGuigan also confirmed last week that Taylor, from Prestonpans, will appear on the bill of the eagerly awaited Carl Frampton Scott Quigg showdown in Manchester in February.McGuigan’s son Jake, who also manages the promotion alongside his father, told the Evening News: “We just thought if there was an opportunity to get Josh out boxing again then it’s one not to be missed. “He hasn’t been training down in London like he normally does but he’s still been in the gym. We know he’ll put on a performance.